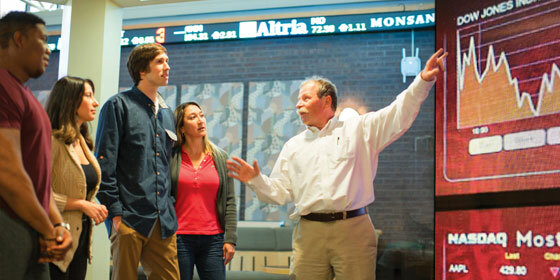 Richard A. Michelfelder, clinical associate professor, analyzing financial data with students, including Michael Williams at the far left. When Michael Williams started his internship at a Big Four accounting firm in Philadelphia, he already knew how to use a Bloomberg terminal featuring real-time stock market data used by professional Wall Street traders. A rising senior in the Rutgers School of Business–Camden, he’d been introduced to it years before in his first semester and had sharpened his skills in the school’s Financial Markets Lab and Center for Investment Management. It’s just one of many ways the Rutgers–Camden business school prepares students for careers in finance by interweaving academics and real-world experience. With architectural plans for a new building for the School of Business–Camden underway, faculty and administrators anticipate an expanded Financial Markets Lab and Center for Investment Management to serve students. The new lab will be a featured part of the 100,000-square-foot building on the corner of Fifth and Market Streets across from Camden City Hall and one block from Rutgers–Camden’s Nursing and Science Building. “Our new home will give us a world-class facility where we can build on our rich history of outstanding faculty research and hands-on classroom education that prepares our graduates for jobs on Wall Street and beyond,” said Jaishankar Ganesh, dean of the School of Business–Camden. The school’s commitment to preparing students doesn’t just lean on technology and field trips, though, said James P. McCarthy SBC’86, who before retiring was the managing director and co-head of Liquidity Solutions with Goldman Sachs Asset Management. “It’s a campus that provides an environment that fosters innovative learning,” said McCarthy, who serves as a guest professor and a member of Dean Ganesh’s leadership council. Jen. A. Miller is a widely published writer and the author of three books who holds an M.A. 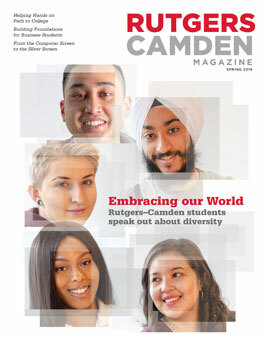 in English from Rutgers–Camden.